It was Canon Berchtold, who gave this peak its name when he undertook the first survey measurements of the Dom and Täschhorn peaks. During the tour, one goes over strongly cracked glacier sections until the Festijoch. 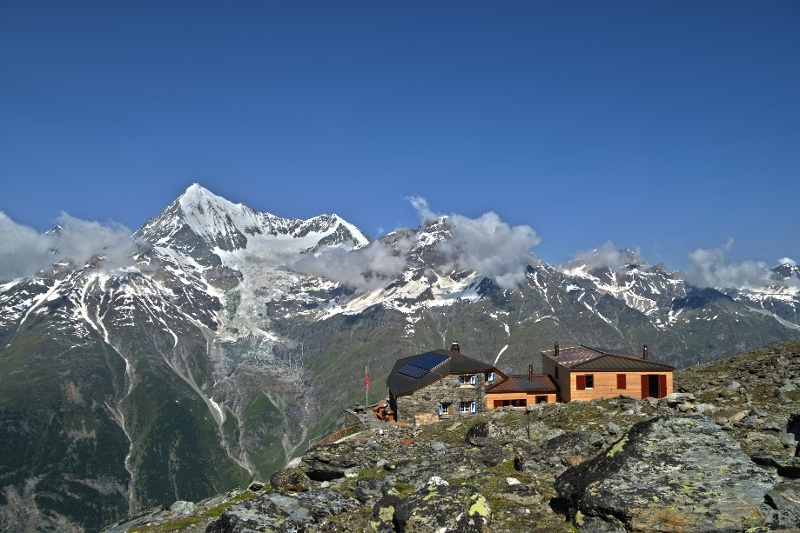 Once here, one makes a short descent to the Hohberggletscher. The trail then makes a large circle below the glacier calving. Since one climbs parallel to the crevices, great care must be taken. Below the summit, one comes to a large drift that one cannot recognise as such from the top. This must absolutely be avoided. The requirements for this climb are excellent physical fitness, experience in using crampons and good acclimatisation. The climb takes about 6-7 hours from the Dom Hut. Once on the summit, the breath-taking panorama proves worth the effort; many have the feeling of overlooking the entire world. The descent to the Dom Hut lasts about 4 hours. But be careful: The way all the way back to the valley is long. We recommend a guided tour with mountain guide who knows well the place. Crampons, climbing harnesses and helmets can be rented in different sport shops in the village Zermatt.